Really cool and unique watch. I really like seeing the clear case. You can see all of the workings of the watch very well. The bracelet is also very sturdy. 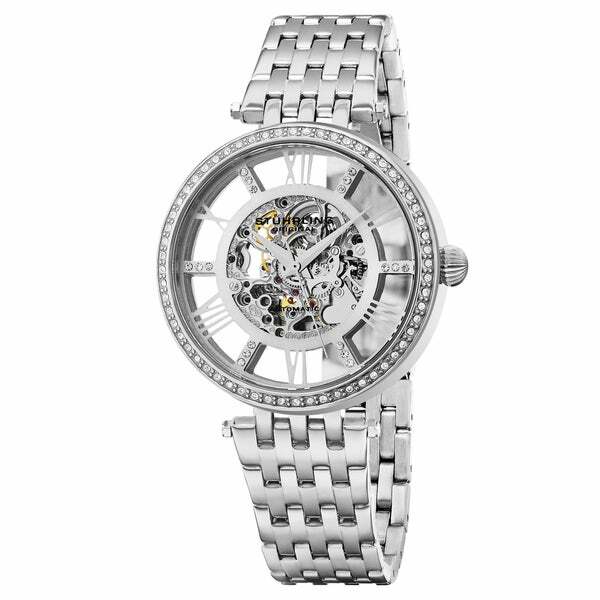 Fully skeletonized, automatic mechanical movement, and a Swarovski crystal filled bezel come effortlessly together to form the mesmerizing Delphi watch. This watch is absolutely without being too flashy. The skeleton face and the crystals on every other number is just beautiful. The size is not too big like some watches but its a good weight, sturdy piece. It's my favorite watch to wear for any occasion at all. Dressing up a casual outfit very nicely. Love this watch. The look is fantastic. The only issue for me is there is a piece of paper (or something) inside the watch. Also, the time stops every so often. These two things may be related. I understand this is an automatic watch, but I’ve worn a couple others for a long time. The others I’ve worn work so long as I’m wearing it. This one stops even tho I’m wearing it, which tells me something is off. Ether way, I love the look, and it works most of the time, so I’m keeping it. I just wanted to note this small issue. I love this watch! Even if I leave it near s crystal off my wrist for a few days it still keeps good time! This is an awesome watch. However the links are difficult to change. Face is pretty large... larger than it looks in the picture.. But it is a nice watch. Beautiful. Received the wrong watch at first and seller was able to exchange for the correct one. the best watch I ever owned! cant say enough about it! just love!! Love my new watch. Very elegant!! !